Definition: Feral Cat (provided by Best Friends Catnippers L.A.
"Feral cats are the offspring of stray or abandoned pets, raised without human contact and living typically in colonies where food and shelter are available. They lead harsh lives, shortened by malnutrition, disease, trauma, and high kitten mortality. Feral cats are often seen as a public nuisance and make up a large portion of the animals euthanized by local control agencies." Yes if the kittens are trapped early enough. OK, But Time Consuming 10- 12 weeks. Some people call any animal born outdoors a feral. Not true. A kitten that was found outdoors and "Bottle Fed and Hand Raised" is not a feral. A "Pet Quality Kitten" - a kitten that has had human touch from and early age and loves people. 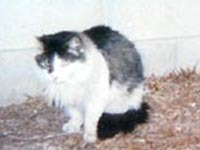 A "Shelter Quality Kitten" - Often born to the family, and often born in garages and allowed to run indoor and outdoors without a lot of human touch. Many can be more aloof and independent because they have lacked a close connection with people. A "Feral Kitten" - Runs and hides from people and will not change unless the animals receives many hours of human touch, becomes accustomed to people other than it's caregiver. and is rewarded with canned for . Set the trigger of the trap to a light trip. Do this by having just the edge of the tripping mechanism touching the trip bar.